The Mediterranean coast of the Costa del Sol is a unique archaeological site, ensuring Manilva a great amount of historical monuments and a very interesting touristic circuit. Manilva Old Town: The Old Town of Manilva is located about 2 km inland and surrounded by vineyards producing the famous Moscatel wine. The town’s most important monument is the parish church of Santa Ana. Parish church of Holy Ana – Manilva: It is located at the Plaza de la Iglesia and is known to be the most important religious monument in the area of Manilva. Its construction took from the 17th to the 18th century and was built over a historic temple of the 16th century. It includes three naves, transept, presbytery and registry. Villa Matilda – Manilva: Villa Matilde in the city centre of Manilva is used as headquaters for the tourism office Manilva. It was owned by Ignacio Infante, brother of Blas Infante. Recently the whole building has been restored and now inside you can admire an exhibition of roman remains found in the surroundings. Castillo de la Duquesa: Castillo Duquesa is also known as Castillo de Sabanillas due to its location at the beach of the same name. In past times a roman settlement was located on the very same place. It included thermal baths, a necropolis and an area for salting. In the 18th century the castle was built over the remains of the roman walls. Its purpose was the defense of the local population and coast against raiding pirates. Over the years the castle has been used as fortification, headquarters of the border police and headquarters of the Guardia Civil. The site’s surrounding has been declared Zona Arqueológica de Interés Cultural (archaeological site of cultural interest). 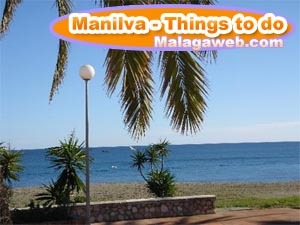 Archaeological sites: In the whole are of Manilva a great number of archaeological sites have been detected. One of the most interesting ones is Villa Romana de la Barriada Sabinillas whose remains were used in the construction of the Castillo de la Duquesa. This settlement even counted with a thermal sulfur bath. Another important archeological excavation is Cerro del Castillo. Archeological excavation – Villa Romana de Sabinillas: The site of Villa Romana de Sabinillas is located next to La Barriada de Sabinillas. Archeological excavation – Cerro del Castillo: The site of Cerro del Castillo is to be found between the two streams of Alcorrín and Martagina. Here you can admire some remains from the Bronze Age. Marina La Duquesa: La Duquesa is the area’s the most lively tourist center and boasts with lots of bars, restaurants, shops and everything a navigator needs. In it’s surroundings you find lots of urbanizations, hotels and an excellent golf course. Torres Almenadas: In the area of Manilva we find the remains of two pinnacle towers (solo adivinando), Torre Almenada de la Duquesa and Torre Almenada Punta Chullera. Both dating back to the 15th century when they served to protect the population from the frequent pirate attacks. El Ingenio Chico: El Ingenio Chico is one of the two sugar refineries built under the Duke of Arcos. It dates back to the 17th century and today some parts of the factory and walls still exist, as well as the aqueduct used to transport water to the machinery. Cueva Rupestre Gran Duque: This cave is located in the gorge of Canuto de la Utrera. Some Prehistorian remains have been found inside. Charca de la Mina: Some Roman and Mediaeval remains have been found at this site. Around the old town, gently-rolling hills dominated by the green of the vines descend towards the Mediterranean and the fertile plains Riven Manilva valley. These endless hills turn our area into an enourmous balcony from which we can see the Mediterranean light reflected in the sea and on the vines. The traditional muscatel grape from Alexandria has long been our most typical crop, producing wines of excellent quality and recognised prestige. Our network of paths is suitable for trips on horseback, on foot or by bicycle. Routes worthy of particular mention include a visit to the pine forest at Tábanos, La Cuesta del Molino (Windmill Hill) and the hills of Miraflores...All of these offer a vast beautiful landscape teeming with history, where archaelogical remains abound, bearing testimony to the richness of its past. The "Puerto deportivo de la Duquesa" (The harbour club La Duquesa) is with no doubt the place with more tourism and has a complete one modern net of leisure and amusement activities.